PLEASE CALL THE COUNTY ANIMAL SERVICES AT 407-836-3111, AND THEY WILL HELP YOU FOR FREE. ONLY CALL OUR COMPANY IF YOU WANT TO PAY FOR CAT REMOVAL. Stray Cat Info: Stray cats are defined as cats that are lost or have become separated from a home or owner. When people refer to stray cats, they usually mean feral cats. Feral cats are simply non-domesticated cats living in the wild. They were born in the wild, and have never had a home. Their behavior is completely different from domesticated cats. They are truly wild animals! There are 60 million cats living in American households, and an estimated 100 million feral cats! Cats are very self-sufficient (as most people are aware) and excellent hunters, and thus able to live in the wild just fine. 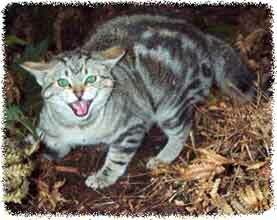 Of all of the wild animals I have dealt with, trapped feral cats can be the most ferocious! They claw, bite, hiss, emit a nasty musk scent, and do anything to escape. I've seen ferals scale a ten foot wall. They're not to be trifled with. When I capture cats I bring them to the humane society in the county I catch them in. They are available for adoption of course, but most are put down after a certain time period. Many people consider this a sad situation, but it is the reality of this country's cat problem. Bob Barker is right: "Have your pet spayed or neutered!" Nuisance concerns: Most people who call me about feral cats complain that the cats are living under a deck or porch, making noise, fighting, or stealing pet food left outside. Many of these people have a genuine concern and care for these animals, and don't like seeing the population getting out of hand. Some people even begin to feed feral cats, and soon find that they are swarmed by hungry felines looking for a free handout. I've even removed feral cats that have gotten inside the home. Feral cats are extremely effective hunters that are known to seriously deplete natural wildlife population, especially birds. They feed on song birds, game birds, mice, rodents, rabbits and other small animals. They are also known to kill poultry and harm domestic pets. This disruption of the natural food chain will reduce the number of native predators in the area. Stray cats will leaving droppings and urine in the areas they live, and will of course scratch and dig. Stray cats are a source of fatal and non-fatal diseases transmittable to humans and domestic cats, including rabies, plague, ringworm, toxoplasmosis, cat scratch fever, allergies, feline leukemia, feline distemper and secondary bacterial infections. Click here for feral cat job prices.
? They mate ? A LOT! Just think; a male cat can mate with a number of different females over the course of the mating season. They can also mate with family pets, leaving some cat owners with rather unwanted litters in their airing cupboards one day! Most of the stray babies will, of course, die but let?s think about it logically; people are already dumping unwanted cats, how is creating more going to add to the problem. Very few cat owners are getting their animals neutered or spayed so when they release the cats into the wild, they are leading the way for an epidemic of kitty babies!
? They travel in packs or small colonies. This can mean a number of things ? firstly, there are going to be territory fights that your family pets could end up getting involved in. Secondly, this makes it easier for them to spread nasty disease such as rabies, feline HIV and feline leukemia, and also things such as fleas and ticks. The latter two are going to cause you all sorts of problems if you get them in your home and you will more than likely need to spend a small fortune on removal of these horrible bugs. Also, rabies can be passed on to humans, which is NOT pleasant at all! You need to remember that most pet owners will not have had their cats vaccinated before they chose to dump them on the streets or kick them out of their homes, so this in turn, is making the cat disease circle an even bigger problem.
? As well as the more serious problems mentioned above, you are also likely to find that stray cats will root through garbage cans, rip open garbage bags, steal food from your own family pets and worse. There are ways that you can help stray cats without even having to go anywhere near them, and the first of which is to call the correct authorities to alert them of the strays roaming around in your neighborhood. From this point you can choose to donate food, (rather than feeding them yourself which can cause more problems still) and you can even choose to re-home an unwanted pet if you wanted to! AAAnimal Control is a professional nuisance wildlife control company. It is my goal to provide information so that you can solve your stray cat problem in an effective and responsible manner. Wildlife services include animal trapping, capture & removal, plus animal damage repairs and preventative measures. You can always browse this site for more details and info about stray cat removal. If you live elsewhere in the US and have found this site and need a local trapper in your area, click here for a nationwide list of 100's of professional stray cat removal experts.